After the popular and successful TV and DVD collaborations The Lost World of Mitchell & Kenyon and The Lost World of Friese-Greene, the BFI and BBC co-produced The Lost World of Tibet. This DVD features the 90-minute director's cut. A rare treasure trove of amazing colour footage, preserved and restored by the BFI, The Lost World of Tibet reveals the story of the Dalai Lama and his secret Himalayan kingdom in a way never told before. An exclusive interview with the Dalai Lama himself, focusing on his early life and childhood, is intercut with colour archive film from the 1930s, 40s and 50s, as well as revealing interviews with ordinary Tibetans who remember life before China sent in troops. 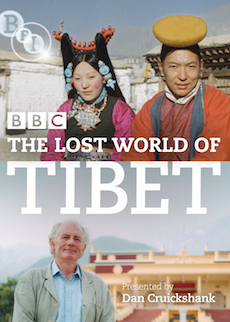 Presented by Dan Cruickshank, this astonishing film allows us a glimpse of the rich culture of Tibet, showing us ancient ceremonies, Buddhist rituals and family life, from a time before Tibetan people lost their sovereignty, nearly 50 years ago. "We were just so engrossed in our little pond," recalls one interviewee. "We knew nothing, what was happening in the world, what could happen. And so we lost our country." The Lost World of Tibet is produced and directed by Emma Hindley.